The uprising, involving hundreds of thousands of Iranian citizens, has raged for more than 13 months in towns and cities across Iran. Men, women, students, teachers, workers, business owners and pensioners have taken to the streets to protest at the violence and larceny of the fascist clerical regime that has stolen Iran’s wealth, oppressed its 80 million people, over half of whom are under thirty, and waged proxy wars across the Middle East. Iran’s middle class has virtually disappeared. Poverty is widespread. People now struggle to feed their families, against a backdrop of power cuts, water shortages and soaring food prices. The protesters have been joined by nationwide strikes involving truck drivers, sugarcane workers, teachers and thousands of ordinary working people. Many have received no pay for months as they watch the venally corrupt mullahs and their families growing steadily richer. Instead of trying to mend Iran’s broken economy the mullahs have used their equivalent of the Gestapo, the Islamic Revolutionary Guards Corps (IRGC), to crack down on the demonstrators, murdering dozens and arresting over twelve thousand. But the Iranian people have lost their fear. They are openly demanding regime change. Iran’s descent into economic chaos can be traced directly to Supreme Leader Ayatollah Ali Khamenei and President Hassan Rouhani. Their policy of aggressive military expansionism across the Middle East has seen them consistently pour men and resources into Bashar al-Assad’s murderous civil war, the genocidal campaign against the Sunni population of neighbouring Iraq, their support for the Houthi rebels in Yemen and their vast funding for the Hezbollah terrorists in Lebanon. They currently pay $750m p.a. to Hezbollah in Lebanon alone. This is clearly no longer sustainable. In a blind panic, as their regime teeters on the verge of total collapse, the mullahs have begun to lash out like a wounded beast. Blaming the biggest and most organised opposition movement, the Mojahedin e-Khalq (MEK or PMOI) and its inspirational leader Maryam Rajavi for the unrest, the mullahs have unleashed a worldwide demonization, blackmail and terror campaign. In June 2018, in a joint operation involving the police, judicial and security authorities from Germany, France and Belgium, two would-be bombers and an Iranian regime diplomat, Assadollah Assadi who had given them the bomb and instructed them to detonate it at a major Iranian opposition rally near Paris, were arrested and imprisoned. Subsequently, similar action was taken against Iranian terrorist plots in the United States, Denmark, Bulgaria, the Netherlands and several other European nations, who are now imposing their own sanctions on the Iranian regime and blacklisting some of its agents. In late December, the Albanian Prime Minister Edi Rama, expelled Iran’s ambassador and first Secretary on the grounds that they posed a security risk to Albania. They had been openly plotting assassination and terror activities targeting the 2,500 MEK opposition members who have built a new compound, called Ashraf III near Tirana. Edi Rama’s courageous act against the bullying and blackmail of the mullahs, earned him praise from President Trump, US Secretary of State Mike Pompeo and from several EU leaders. Prime Minister Rama should now set an example for the EU by exposing the Iranian Embassy as a bomb factory and terror cell and ordering its immediate closure. Now, as the Iranian people prepare to celebrate the anti-monarchist revolution of 1979, which overthrew the Shah, revolution is once more in the air. The MEK has set up underground opposition units in virtually every town and city in Iran. These fearless freedom-fighters are helping to coordinate the protests, strikes and demonstrations around the clock. After 40 years of oppression, cruelty and corruption, the Iranian people have had enough. The mullah’s fascist regime cannot survive and the protesters have been greatly emboldened by the new tough stance of the Americans, which has gained steadily increasing support from the EU. The years of appeasing the mullahs are over. The conference, scheduled to take place in Warsaw in February, will be a key focal point in exposing the terror campaign of the mullahs’ regime. It will seal the regime’s fate. The Iranian people support Mrs Rajavi's 10-point plan for a free and democratic Iran, whose central platform is the formation of a republic based on the separation of religion from the state, pluralism and the stated freedoms in the Universal Declaration of Human Rights. The 10-point plan has been welcomed by ordinary Iranians and enjoys the support of a wide range of parliaments and prominent personalities in Europe and the United States. It is clear that in the MEK there is a credible opposition movement ready and prepared to restore peace, freedom and justice to Iran’s 80 million citizens. The West must recognise this fact and provide their full support to the new revolution. 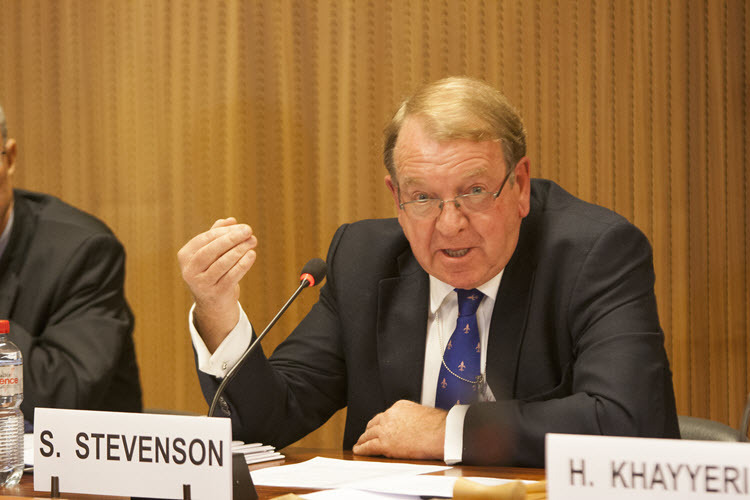 *Struan Stevenson is the Coordinator of the Campaign for Iran Change (CiC). He was a member of the European Parliament representing Scotland (1999-2014), president of the Parliament's Delegation for Relations with Iraq (2009-14) and chairman of Friends of a Free Iran Intergroup (2004-14). He is an international lecturer on the Middle East and president of the European Iraqi Freedom Association (EIFA).